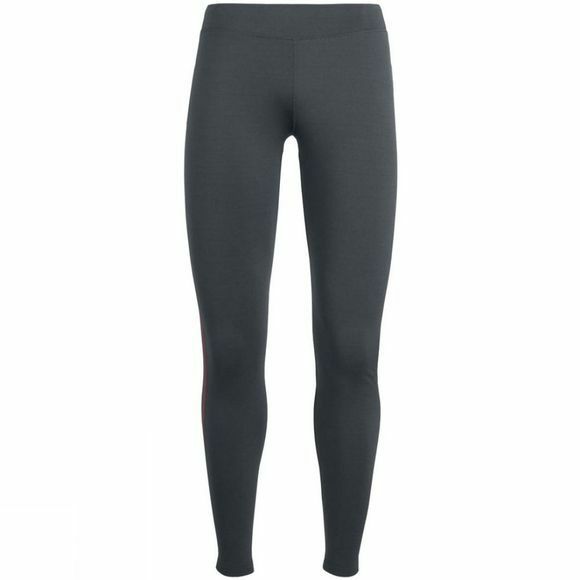 The Womens Comet Tights from Icebreaker are flattering slim-fit tights that are perfect for cold weather trail running, hiking, snowshoeing or Nordic skiing. The Comet Tights are soft, stretchy and highly breathable. Made with a technical terry blend of merino wool, nylon and Lycra, the Comet Tights also feature flatlock seams throughout for chafe-free comfort when you’re on the move. With a tapered leg opening and gusseted design, the Comet Tights also function as a heavyweight baselayer under a shell pant for skiing, snowboarding or hitting the trails in stormy conditions. The wide, contoured waistband features an internal drawcord for a secure fit, and the zippered back stash pocket holds your key or small essentials.